The 4th International Conference on Information Technology (InCIT2019) has goal and objective to be the forum of sharing the research in the related areas of information and communication technology. We believe that the research encompasses intelligent technology and innovation for the next society of human being will be very important. 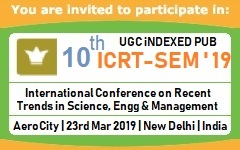 Authors who involves those research areas are cordially invited to submit papers and present in InCIT2019. In addition, the conference will strengthen the collaboration and provide opportunities for delegates to exchange and discuss new innovative ideas and research results, as well as the future directions for cooperative research. InCIT is the International Conference regularly organized by The Council of IT Deans of Thailand (www.citt.or.th) in every year from 2016. InCIT2017 and InCIT2018 were officially approved by IEEE for technical support and co-sponsor. All the presented papers have already uploaded to IEEE Xplore Digital Library. Continuously, the InCIT2019 has already received the official recommendation from the IEEE Thailand Section for endorsement of the IEEE technical support and co-sponsor. The MOU/LOA with IEEE for InCIT2019 will be achieved. The venue of InCIT2019 will be at the conference center in Building E of Thai-Nichi Institute of Technology (www.tni.ac.th). The location is closed to Bangkok International Airport and the central of Bangkok. Furthermore, the Building E is the newest and just opened for operation from January 2019. The conference center is very modern and fully equipped with excellent infrastructure. Please come and attend InCIT2019, and enjoy your short visit to Bangkok and Thailand as well.